Google honoured Indian-American Noble Prize winner in Physiology Har Gobind Khorana with a doodle. He was known for his extensive research on Deoxyribonucleic acid (DNA). After his enormous achievements and contribution to the science field, Khorana was elected as foreign member of Royal Society in 1978 and awarded the second highest civilian award of India, the Padma Vibhushan. 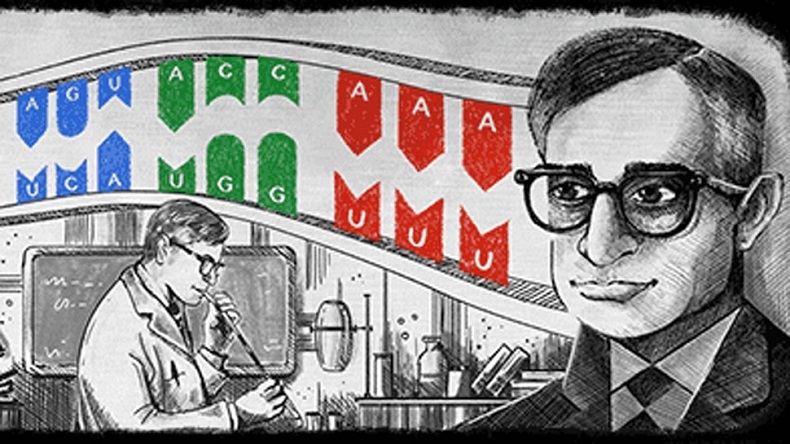 The man who constructed the first synthetic gene and Indian-American Noble Prize winner in Physiology Har Gobind Khorana has been honoured by Google with a doodle. Today is 96th birth anniversary of Dr. Khorana who was known for his extensive research on Deoxyribonucleic acid (DNA). Dr. Khorana was awarded Noble Prize in Physiology or Medicine in 1968 along with two other scientists – Robert W. Holley and Marshall W. Nirenberg “for their interpretation of the genetic code and its function in protein synthesis”. Khorana was born in a small village of Raipur, Punjab (now in Pakistan) in 1922. His passion for science started when he was a young boy. Thankfully, his father encouraged him in following his dream and getting education. After his graduation and masters from Panjab University, Lahore Khorana moved to England for his doctoral studies at the University of Liverpool. The DNA research which awarded him the Nobel Prize, he began at the University of Columbia. In 1960 he moved to Institute for Enzyme Research at the University of Wisconsin. The scientist discovered the order of nucleotides and determines how DNA are built in our body. Nucleotides are the sub units of DNA or RNA, and consist of bases made of nitrogen. There are four types of nucleotides for each DNA, and RNA, an the order in which they are put connected — forming the double helix is important for determining which types of proteins the cells create. Proteins are responsible for basic form and functions. The research which make him prominent personality in science was construction of the world first artificial gene. Khorana also became an expert on the chemical synthesis of proteins and nucleic acids. After his enormous achievements and contribution to the science field, Khorana was elected as foreign member of Royal Society in 1978 and honoured with National Medal of Science. He was also awarded the second highest civilian award of India, the Padma Vibhushan. He passed away at the age of 89 in Concord, Massachusetts, United States.